Signs on Grand Avenue and only one entry to fish fry. Line can back up at times, but paying first and getting your order ticket keeps line moving fairly effectively. Real plates and silverware! May be one of the few fish fries to use real plates. We got there early at 5 and there was already a full house and about a 10 minute wait in line. Easy menu signs while you wait in line and as you get your food. Could be a little more efficient with serving, such as some churches where sides are selected when you pay, but a faster line would overwhelm the dining area. Still the class of fish fries with real plates. It was so nice to have a cup of coffee in a real cup (2010). Very good Cod, maybe not the best, but very high ranking. Homemade desserts and very good sides. Other entrees included baked cod and fried catfish. Sides included cole slaw, mac and cheese, potato salad, and green beans. Nothing has changed our minds here. Cod is still very good. Although my piece and the kids, which were from different batches, were a little inconsistent. Cole slaw was excellent. Desserts were varied from store bought to homemade. My cod was excellent. Even better than the last time we came. Potato salad and cole slaw were top notch. $7 adult plate includes two sides, dessert, tea and water - everything! No kids menu, but half plate for $3. $2 beer, $3 Schafly's, $0.75 soda. Prices haven't changed and have even gone down for drinks. $2.50 Schafly's, $1.50 cans of beer, $2 wine. Dessert, tea, and coffee include. Fair trade coffee is pretty good especially in a real cup. Also $1.50 mac cheese/applesauce combo for the "toddle" plate. For our family of five, $22.50, not including a Schafly's. For our family of five it was $28. $8 for adult plates and $4 for kids plates. A great value. Although portions have changed I think. Adult plates come with one piece of Cod, the kids a half piece. I think adult plates used to be 2 pieces of Cod. Still plenty of food, but if you have a hungry child, you may want to consider the adult plate if they eat a lot. Schafly beer has gone up to $3. With an additional kids option of mac and cheese for kids, our family of 5 was only $25! Could that really be right? A good value. Great and friendly service. Volunteers are quick to clear your plates. Live music most Fridays. Hall has a nice feel with a stage area and although somewhat small, doesn't feel cramped. Atmosphere has always been a strong suit, with a coffee house style vibe with the cozy surroundings and live music. Attentive and friendly staff to help clear plates and trays. St. Pius really outdid itself tonight. The music was fantastic! Solos, instruments, and even a fish fry song! A great fish fry atmosphere. The volunteers are fantastic with plenty of help clearing tables. 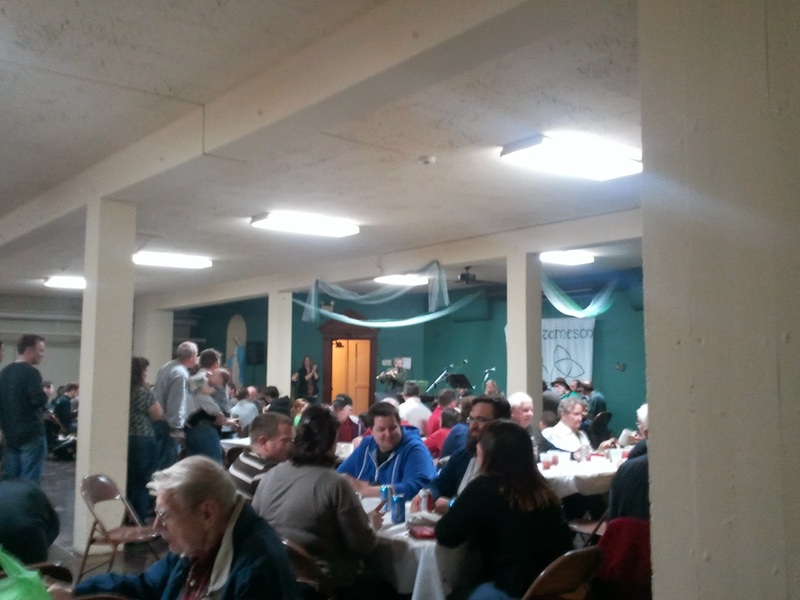 There's no better place to be on a cold winter night than a fish fry at St. Pius. 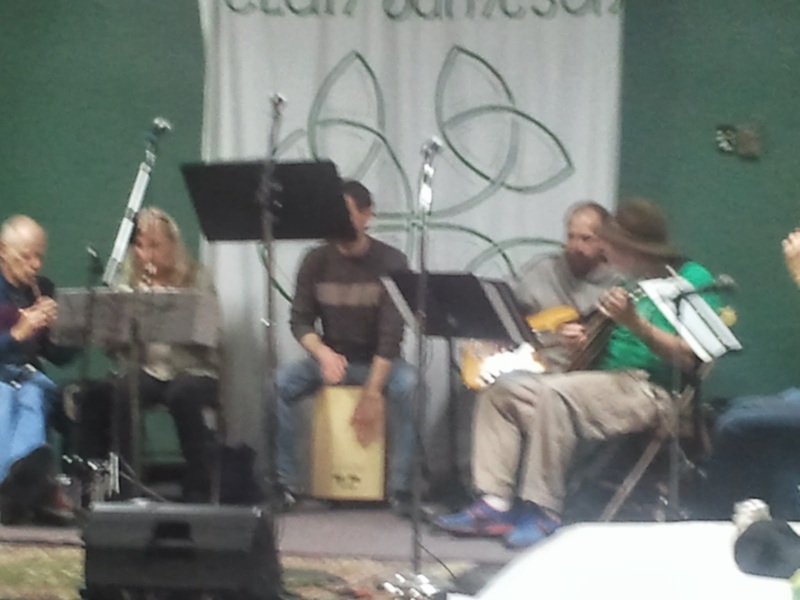 A steamy cup of coffee (in a real cup) and lovely irish music - doesn't get much better. 4 out of 4. The standard for fish fries! Maybe not the highest ranking cod, sides, or atmosphere, but very high ranking in all categories. Everything is well done. Who else uses real plates! Well, revisiting St. Pius after three years, the question was - "Would it still rank number #1?" And although I'm biased (I'm not going to change too drastically especially with a sign welcoming Friday Night Fish), it is still the preferred fish fry for the FNF family. Real plates, music, and the real coffee cups (did I mention the coffee cups) make you want to stay and linger, except for the guilt of knowing there is a long line of people waiting for a seat. The only downside to St. Pius is that it has become a victim of its charm. The larger crowds are threatening some of coziness and stretching the facilities. So come early! 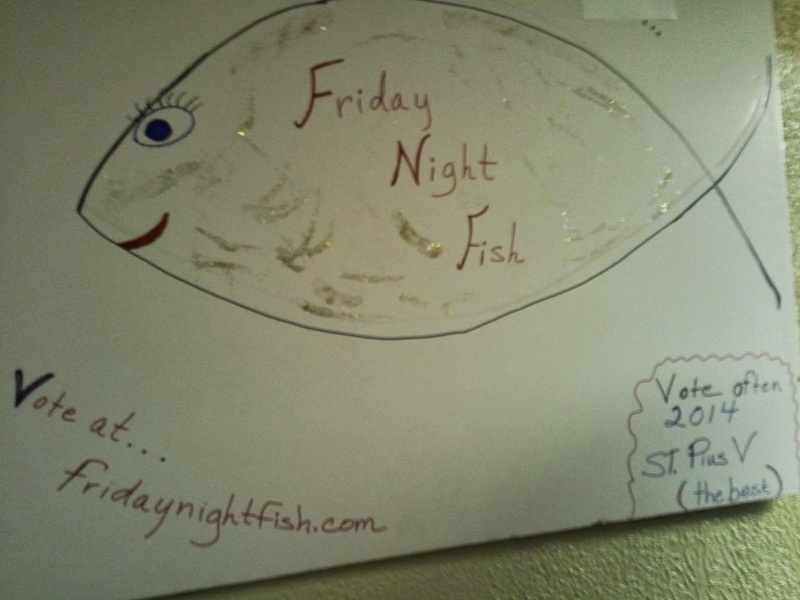 Are we biased toward St. Pius (they are the closest to where we live and they have a Welcome Friday Night Fish sign) - of course we are! But rightly so! 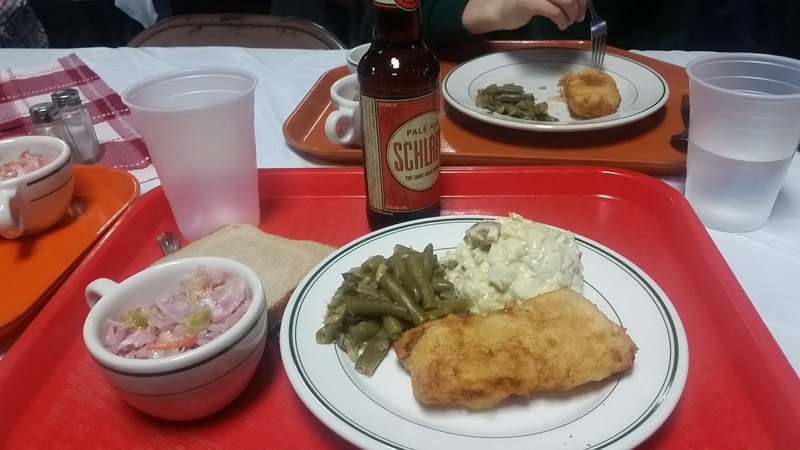 Great food, atmosphere, and value show why St. Pius is ranked as Friday Night Fish's top fish fry. Our most recent visit only confirmed what we already knew. A great fish fry evening! Can you ever go to St. Pius too often? Never. We weren't going to go tonight, but with the icy weather moving in, we decided to stay close to home. We got there early (5:15) so didn't have to wait in line. The food was great tonight, the live music started up close to 6. The coffee rivals some coffee houses. Can't ask for more from one of the best fish fries in the region. St. Pius is like a comfortable sweater on a cold night, it just feels cozy. 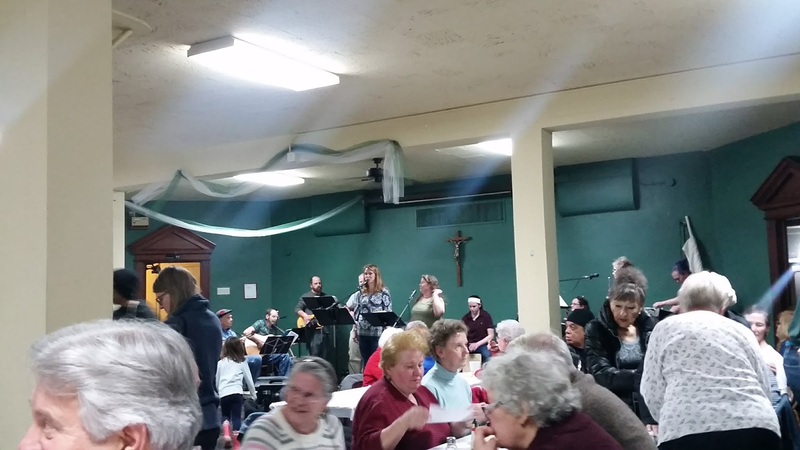 Delicious Cod, festive music, warm atmosphere - everything a great fish fry should be! 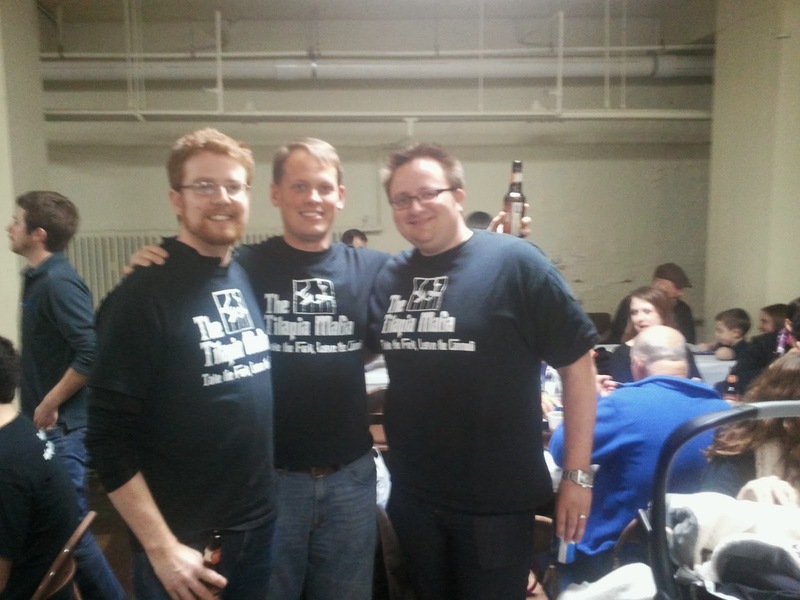 It's a great deal at St. Pius's Fabulous Fish Fry. We even have our very own song describing the great meal. Thanks for the 4-fish rating! Come back and enjoy the food, music and comaraderie - again and again? St.Pius is the highlight of my Lenten Fridays !! This years "Weekly Specials" are a great addition. Thanks to you all !!! 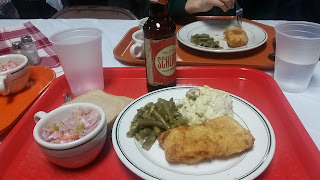 As good as any fish fry I have been to in St. Louis. Music is great. Plenty of food for $7. We were also at St. Pius this Friday. YUM!!! Love the real dishes...not plastic. Only waited about 10 minutes. Loved the music. Worth any wait. Food was great, I had catfish. Full meal with real china was super. Music was wonderful addition. St. Pius Fish Fries have it all! Great food, live musicians and singers, lots of fun for kids...a real family affair, well organized, great variety of homemade desserts, meals served on real china...just a super night out! Three sides offered in 2011, not two as stated above.